Since it has happened three times now and each time after assigning an IP address to a docker, that is fairly good evidence that, at least on my system, I am unable to assign a separate IP address to any docker. Every time, call traces appeared in the syslog hours after the IP address assignment and continued until I either uninstalled the docker or removed the IP address assignment and let it go back to using the unRAID host IP. Other Information: The latest call traces started after installing Pi-Hole on the evening of March 25. The call traces started on the 26th and several have been generated every day since then. In every case, all call traces disappear if the ip address assigned to the docker is removed and the docker goes back to using host ip address. Perhaps I will try one of the 6.5.1 RCs and see if any changes in kernel, etc. impact this. I updated my main server (where the call traces are occurring) to 6.5.1 RC2 on the off chance that a kernel change would resolve the call trace issue. Although it took a little longer for them to reappear. the call traces are back and, once, again, are related to ip addressing, macvlan, etc. My next step will be to remove Pi-Hole and see if the call traces disappear. I am fairly confident that they will. @limetech @bonienl Since this is obviously not a general defect with unRAID/docker networking I don't expect any resolution from you. However, I will continue to experiment and look for a resolution on my own should this be helpful to anyone now or in the future. I updated the server to 6.5.1 RC3 three days ago and, so far, have only seen one call trace. It is still the usual suspect (IP/macvlan), but the call traces appear to have lessened in frequency, or, my recent usage patterns have not triggered them. Since it appears my experience with call traces when assigning IP address to dockers it not shared by other users, perhaps it is a hardware issue unique to my server. unRAID/docker LAN is currently on eth0. My MB has two NICs. Perhaps i will try assigning the dockers to eth1 and see how that affects the issue. I could try bonding as well. I don't know if any of that will help, but, I suppose it is worth a try. I believe the GUI/unRAID is tied to eth0, correct? I am now running 6.5.1 RC5 on main server and backup. At least one other user is experiencing the same call traces with an IP address assigned to the Pihole docker. He has completely different hardware than I do (Supermicro server, Xeon E5) so, I am less certain this is a hardware issue unique to my system. I had to disable Pihole this morning. Overnight it had completely locked up my unRAID server (perhaps due to the ever increasing number of call traces generated). Since Pihole was my DNS, the whole network was inaccessible. I had to hard reset the unRAID server since even the GUI was locked up. There was a Pihole update last night which I applied after rebooting everything as the previous update was causing many issues for many users - perhaps it was the cause of my problems as well. Still, ip/macvlan call traces were being generated regularly in the syslog. I have now disabled the Pihole docker and reset my router DNS back to what it was prior to installing Pihole. I am sure the call traces will go away as well. Not the solution I want, but, it is the only one available to me now. EDIT: Disabling Pihoie, as expected, put an end to the call traces. On to the next attempt to track down the cause and eliminate these ip/macvlan call traces. My server has two integrated NICs (Intel i210 and Intel i219-LM). LAN1 is the i210 and LAN2 is the i219-LM. I have both enabled in the BIOS but I only had a LAN cable connected to LAN1. In unRAID Network Settings, LAN1 showed up as eth0 and LAN2 as eth1. LAN2/eth1 had no settings configured as nothing was connected to it. Step 1 (as a control step) - disable Pihole docker for 24 hours and reset DNS in router to not use Pihole; result - NO call traces. This confirms the call traces are coming from Pihole with its IP address assignment. I also disabled all unused MB and security features in the BIOS. UPDATE: Now at 28 hours without a call trace. I am not yet ready to declare victory, but, it looks promising; at least more so than anything else I have tried. After changing the NIC from LAN1 to LAN 2, the system ran without ip/macvlan call traces for over 3 1/2 days. That's a new record; however the old familiar call trace returned just after updating to 6.5.1 RC6. I have since rebooted the server and will monitor for the return of ip/macvlan call traces. It's been about 2 1/2 days since the last reboot and the server just experienced another macvlan call trace. It looks like the change of NIC and/or unRAID 6.5.1.RC6 is not a cure; although the frequency of call traces has diminished. UPDATE: Apr. 19: Another identical call trace has occurred less than 24 hours after the last one. It almost seems that one a call trace is generated, subsequent traces begin to come with more frequency. It is now clear that I am not the only one getting macvlan call traces on my server and these are not just related to my specific hardware. Below are three reports of the same in last couple of weeks/days. We all have very different hardware configurations. I am sure there are others. One one occasion, the call traces came every hour and I eventually had to reboot the server. These only occur when an IP address is assigned to a docker container. This entire thread documents my efforts to isolate and resolve it on my own. The best I have been able do is eliminate the frequency of macvlan call traces by changing the MB NIC which unRAID/br0 uses. I am now running 6.5.1 RC6 on my server. 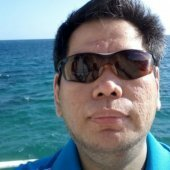 Since you cannot reproduce, I am happy tp keep digging around on my own, but, if you have any guidance regarding things I can test or information I can provide, that would be helpful. Overall the incidence of call traces for a variety of reasons seems to be increasing among the general unRAID user community. It seems most (all?) of your call traces come from pi-hole. Let's start with comparing the settings of pi-hole and see if there are noticeable differences. I am running pi-hole on a separate interface (br1) and have given it a fixed IP address (10.0.101.99). This IP address is used both as management and DNS address. My router is the DHCP server, and it has a configuration to tell that clients in my network must use 10.0.101.99 as DNS server. Since pi-hole internally only knows interface "eth0", it is told to use and listen only to that interface. I am using the br0 network and have assigned IP address 192.168.1.100 to Pihole which is both the admin and DNS address. My router (Ubiquiti USG) is the DHCP server and it is configured to tell LAN clients that Pihole is the DNS. The differences I see are the specified interface which is br0 (not eth0; although they physically share the same NIC) and Pihole is listening on all interfaces. Should I change those both to eth0? I followed the Spaceinvader One video guide for setting up Pihole on unRAID (as I suspect many have) and I do not believe changing those variables was mentioned; however, perhaps it is necessary? Again, some tweaks here may result in the elimination of Pihole generated macvlan call traces, but, I did experience them with other dockers as well. Admittedly, that was with unRAID 6.4.0/1 and perhaps they would be less prevalent in 6.5.0/1. I see the macvlan call traces seem to be associated with a macvlan broadcast. macvlan_process_broadcast seems to come just before each call trace and the broadcast is referenced in the trace. Is this because the docker INTERFACE variable is br0 instead of eth0 and it is listening on all interfaces instead of being restricted to eth0? UPDATE: I have gone ahead and changed INTERFACE and DNSMASQ_LISTENING variables from br0 to eth0. We'll see if that changes anything. Have you tried pluging in another cable to eth1 (without assigning an IP to it) and migrating the docker custom networking to br1 instead of br0? No, that I have not tried, but, it's easy enough to do. I will give that a shot and report results. @bonienl I changed the configuration of my Pihole docker to match yours by setting the INTERFACE and DNSMASQ_LISTENING variables from br0 to eth0. The server ran for 4 1/2 days with no call trace. Yesterday, I updated the server to unRAID 6.5.1 final. It ran an additional 24 hours until another call trace appeared. I'll try next what ken-ji suggested and move pihole docker to br1. I have enabled eth1 and cabled that to my switch without assigning a static IP address to eth1. 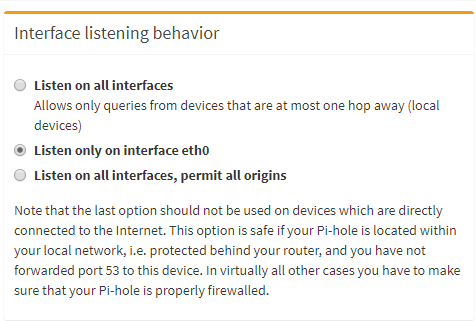 Does it make a difference when you limit pi-hole to listen to a single interface only (see settings -> dns) ? That is the current setting. I assume it has always been set to eth0 only as I have never changed it. I will likely assign an IP address to a couple of other dockers to continue testing, I don't think this is a Pihole-specific issue as I got the call traces with other dockers as well.. It's been 36 hours since my last reboot (not associated with call traces), so, i will probably have to wait a few days to know if any changes I have made with docker networking make a difference. @bonienl I assigned some other dockers (DelugeVPN, Handbrake, Dolphin) their own IP address on br0 as a test. Although it took a couple of days, the server again experienced several macvlan call traces over a period of several hours. I have now created a docker VLAN and have DelugeVPN, Handbrake, Dolphin and Heimdall dockers running on br0.3 (192.168.3.x) with static IP addresses. Pihole is still running on br0 with a static IP of 192.168.1.100. I suppose for a true test I should really move Pihole to br0.3 as well, but, since it is the DNS for the 192.168.1.x LAN I'll first have to create some routing and firewall rules in UnifFi. That will be the next step; move Pihole to br0.3. I seriously doubt it makes any difference, but, I have always assigned static IP addresses to the dockers as opposed to letting Docker assign them from a docker VLAN DHCP pool. I have now taken Pi-hole on br0 out of the picture. I am running it on a Raspberry Pi instead of as a docker. It was too inconvenient that when my unRAID server was down, the Internet, for all intents and purposes, was also inaccessible. Putting Pihole on the Pi took care of that. I have Heimdall running on br0 and the rest as either bridge or host for the moment. We'll see if just Heimdall on br0 with a static IP results in macvlan call traces as other dockers have. After running Heimdall as the only docker on br0 with others assigned to br0.3, call traces again appeared after a day or so. I now have no dockers at all running on br0 and have assigned just Heimdall and Handbrake to br0.3. Hopefully a docker VLAN as opposed to host bridge will yield different results with static docker IP addresses. I am having a similar event. I use a Plex docker which is set to DHCP for IP assignment on the br0 interface. 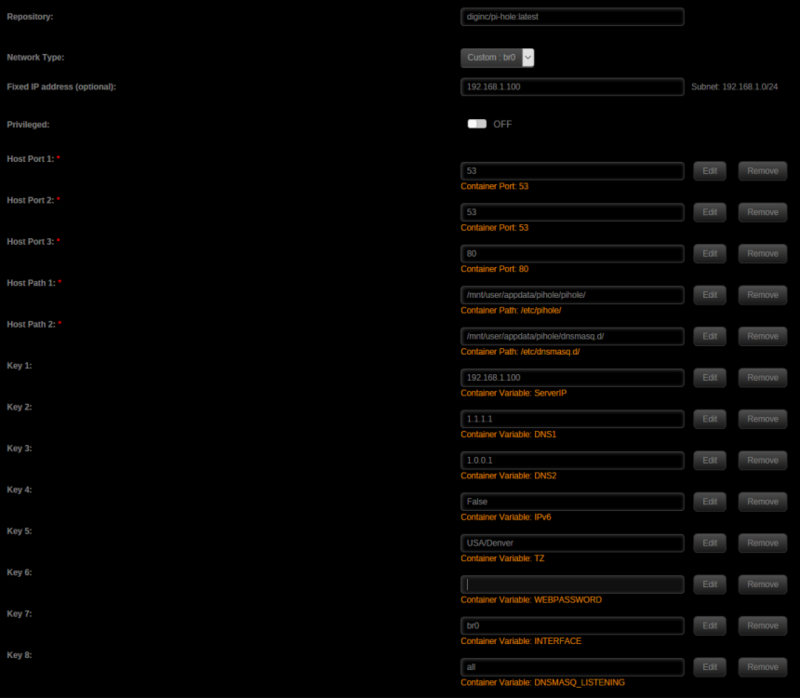 No plugins installed, only modprobe the i915 module for hardware transcoding. Plex is the only Docker installed and running. In my case, I think I have isolated the problem to br0. If I have even one docker with an IP address on br0, I will get call traces. As an experiment, I setup a docker VLAN (br0.3) and assigned a couple of dockers to the 192.168.3.x subnet while removing everything from br0. It has been almost 12 days now with zero call traces. I thought that might have to do with dockers generating little network traffic, so, I restarted my Pihole docker and assigned it to br0.3 as well. So far, it is two days in with zero call traces on br0.3 (needs a bit more time to be sure). When I had dockers (any docker) assigned to br0, the longest the system went without a call trace was four days. After running for a few more days with all dockers on br0.3, I will move one or two back to br0 as a final test. If I get call traces on that interface within a few days, that will solidify my conclusion that br0 is the source of call traces on my system. I think the other users (at least a half dozen or so) reporting call traces with docker IPs also had them on br0. I would prefer to have dockers on br0 and the same subnet as the rest of my LAN, but, if that is not possible, br0.3 appears to work without generating call traces even though it isolates those dockers completely from the host unRAID system. Macvlan call traces are definitely caused by assigning IP addresses to dockers on br0 on my system. With several dockers assigned IP addresses on br0.3 (docker VLAN), unRAID ran for over two weeks without a single call trace. Within two days of assigning a couple back to br0 as a control test, call traces again appeared. I think it is safe to say, I only get call traces with dockers (any docker) assigned IP addresses on br0. As a test I have now moved a number of my containers from br1 (separate interface) to br0 (shared interface). All these containers have a fixed IP address. It will work fine for you and you will never see call traces. That's always the way it goes, right? ? Both br0 and br0.3, of course, are shared interfaces. I get call traces on br0 but not on br0.3. I have never tried assigning any dockers to br1. I have a second NIC, so, perhaps I should try that. My guess is the system would be call trace free on br1 as well, but, I will verify. They share the same physical interface, but in terms of networking they are logically separated. I never had call traces before, and initially I started with br0, but I have more containers running now, including the "problematic" pi-hole container. So far so good (=no traces), but I let it run a couple of days longer, to be more conclusive.